In A Nutshell: Located in the heart of San Francisco, the iconic Palace Hotel dates back to 1875. It was the city’s first luxury hotel, and celebrities and dignitaries from around the world have flocked to it. Today, the remodeled Palace Hotel remains one of the most elegant places to stay in The City by the Bay. 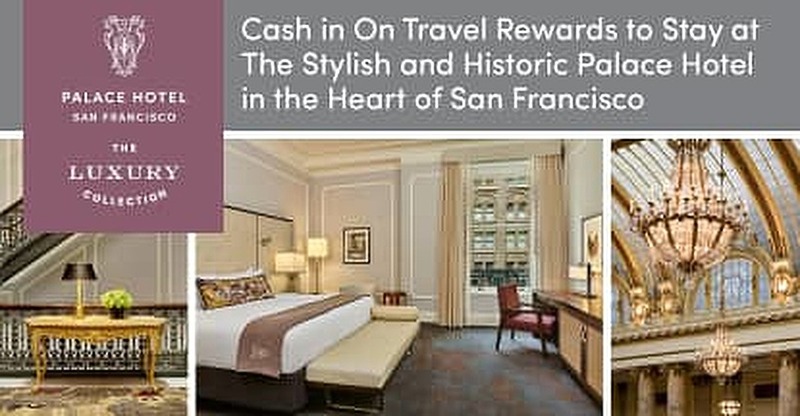 San Francisco is a popular destination for credit card users to cash in their travel rewards, and many choose to stay in style at the Palace Hotel. Its preserved architectural beauty includes a celebrated painting by Maxfield Parrish in the hotel’s Pied Piper bar. The Palace Hotel has been a destination for luxury experiences for more than a century, and it plans to remain that way for generations to come. Even though I grew up on the East Coast, I’ve always loved California. I travel there when I can to soak up the sun and the relaxed, youthful vibe. I’m especially fond of San Francisco, with the fresh bay breezes drifting through its vibrant culture of art, music, and history. I was in my early 20s when I first visited San Francisco. I went for a week with my friend and her sister, who had racked up enough miles on her credit card to upgrade us all to first class for the flight. Our week was filled with a concert at The Greek Theatre in nearby Berkeley, hiking among the redwoods in Muir Woods, buying tie-dyed shirts in Haight Ashbury, and visiting the Golden Gate Bridge and Fisherman’s Wharf. Now, I’m the one with the travel rewards, and while flying first class is nice, staying at a luxury hotel when I arrive is more important. I caught a lot of what the city had to offer during my whirlwind visit, but it missed an iconic, century-old fixture in the heart of the city: The Palace Hotel. The Palace Hotel opened in 1875 and welcomed celebrities and dignitaries as San Francisco’s first luxury hotel. The Palace Hotel dates back to 1875 when it opened as not only the first luxury hotel in the city at the time, but also the largest elegant lodging and dining destination in the world. It held that title for three decades until the 1906 earthquake struck San Francisco. But the hotel bounced right back, and a recent remodel has brought the hotel full circle back to its former glory. Even though the Palace Hotel stood strong through the 1906 earthquake, it didn’t survive the aftermath. “The owners had the foresight to build a structure that was very sound, so the earthquake did not destroy the building. But fires raged down Market Street and the hotel crumbled from the inside out,” Renée said. Its destruction in 1906 could have been the end of the famous hotel’s story, but its owners decided to write a new chapter. In just three years, the structure was rebuilt and reopened to much acclaim. The Maxfield Parrish painting, “The Pied Piper of Hamlin,” was commissioned for the special occasion, and The Garden Court’s beautiful dining room was unveiled as the glamorous hotel’s crown jewel. The Palace Hotel’s Garden Court is one of the most elegant places in the city to share a meal. More than a century later, the hotel has remained one of the most sophisticated locations to enjoy a night out — or in. It has been thoroughly renovated to maintain the historical charm that makes the Palace Hotel so iconic. Unlike many luxury hotels, the Palace Hotel has three separate dining areas, making it easy to choose between a fancy dinner or something a little more casual. The Pied Piper, named after the famous painting that hangs behind the bar, offers classic American comfort food. And, like the city around it, the Pied Piper usually has a pretty lively atmosphere. The Pied Piper bar is a big hit with visitors and locals alike. Complete with glistening crystal chandeliers, The Garden Court offers fine California cuisine while the GC Lounge is a more informal place to catch up on some work. Still, by all means, take time for tea and enjoy some of the iconic dishes served on the menu. Of course, the Palace Hotel is also famous for its luxury accommodations and the highest level of amenities that distinguished travelers expect. They offer 24-hour in-room dining, a beautiful indoor pool with a skylight, and a renovated, full-service fitness center. The guest rooms have also been recently updated, and a renovation of the meeting rooms will be complete soon. Any time of year is a great time to visit The Palace. During the holiday season, the hotel is decked out in its finery. In the summer, the hotel boasts plenty of activities, too — in large part because of its central location in the city. Couples can find activities that pique their interests and take a stroll back to the Palace Hotel to retire in the lap of luxury each evening. And the walk back is a little easier on the legs since the hotel is one of the few places in the city not on a hill. Always ready for adventure, Suzanne Wentley has been traveling the world without a home base since 2015. A former newspaper environmental reporter and communications executive, she now works remotely as a copywriter, marketing consultant, yoga teacher, and energy worker. She enjoys wellness, animals, and exploring unknown land and cultures on credit card travel rewards. Follow Suzanne’s work at thelovelightproject.com.